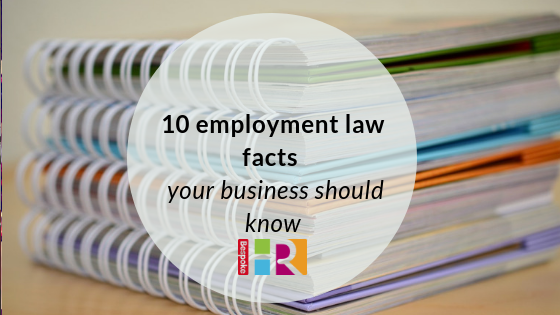 Employment law is constantly changing, with new legislation being introduced on a regular basis. The consequences of failing to follow employment law can be costly to a business – in both monetary and reputation terms. Register as an employer: if you’re employing even one member of staff, you must register with HM Revenue & Customs (HMRC) as an employer. This means reporting payroll information. Run background checks: make sure your staff are legally allowed to work in the UK and keep a record of all documentation. Provide a contract of employment: all employees are entitled to a written statement of employment within two months of starting work. Any employee working for less than this period does not require a formal contract. Pay minimum wage or above: you must ensure that you pay all employees at least the minimum wage, check out the latest rates on the government page. Pay full holiday entitlement: all employees are entitled to 5.6 weeks paid holiday per year, and part-time workers the same on a pro-rata basis. Auto-enrol eligible employees: into a workplace pension. Unless they opt out, you must give them access to a contributory pension and make contributions from your business to their fund. Understand the rules on sick pay: All employers must pay Statutory Sick Pay (SSP) for their workers. This is currently £92.05 per week for up to 28 weeks. The government has a useful calculator to work out how much you need to pay. Check out our full blog on sick pay. Comply with health and safety legislation: it is an employer’s duty to protect the health, safety and welfare of their employees and other people who might be affected by their business. Employers must do whatever is reasonably practicable to achieve this. Visit the Health & Safety Executive (HSE) website for full details on what this should involve. Understand maternity rights and pay: to qualify for statutory maternity leave employees must have an employment contract (it doesn’t matter how long they have worked for you), and given you the correct notice (at least 15 weeks prior to the baby’s due date). Statutory adoption leave is the same, and paternity leave covers one or two weeks consecutive paid leave for a partner. Statutory maternity pay and adoption pay is at a rate of 90% of the employee’s normal weekly earnings for the first six weeks. For the remaining 33 weeks it’s £145.18 per week, or 90% of their average earnings if lower. For a full breakdown, the government has an employer guide on its site. You must provide details of your disciplinary rules and procedures: even if you only employ one person. For guidance take a look at the ACAS Code of Practice. For more information on how we can help with employment law, get in touch.